BRIDGEWATER, Mass. – After a slow start, the game and season seemed lost for fifth seeded Oliver Ames (16-6), which had fallen behind by as many as 15 points in the third quarter and trailed 44-30 after Shannon Lynch (14 points) nailed her third three-pointer of the third, but it turned out to be the moment when the Tigers finally got going. OA rallied with an 18-2 run, sparked by league MVP Kayla Raymond’s 11 points in the third and a strong performance off the bench by freshman Caroline Flynn (15 points), which put the Tigers improbably ahead by two and provided an exciting finish to a game that fourth seeded Bridgewater-Raynham had largely controlled. Unfortunately for the Tigers, the Trojans had a comeback of their own and it proved decisive. Raymond (19 points) scored to put OA ahead 53-51, but the Trojans responded with the game’s final 10 points and pulled out a 61-53 victory that sends them into the Div. 1 South semifinal to face top seed Newton South and ended OA’s first tournament run since moving up to D1 this winter. Although OA would lead 9-8 after the first quarter, it was a sluggish start for the Tigers. Turnovers would plague OA for the entire first half, as it racked up 18 of them, many of which were unforced. Raymond and junior Alex Sheldon, the team’s two leading scorers were held to just one basket apiece in the first, sophomore Erin Holmberg picked up early foul trouble and senior Abby Reardon went to the bench for a spell due to an injury. It was not the start that the Tigers were hoping for and gave the Trojans the opportunity to build an early lead. Sheldon (10 points and 10 rebounds) drove to the basket for an old-fashioned three-point play that tied the game at 17-17, but B-R closed the half with nine straight, including five from Kaleigh Matulonis (19 points). The Tigers showed flashes early in the third quarter of being able to get back into the game. Raymond got a three-point play off a Katie Flynn inbound pass, Caroline Flynn hit a runner on the baseline, and Raymond closed the gap to eight with a steal and transition bucket, but each time the Trojans had an answer from deep. When Raymond ended the third with a corner three off a Holmberg pass, it cut the lead to 44-33 and gave the Tigers a little bit of energy, but it did not seem at the time that it would kick off a furious comeback. Meg Holleran added a three to start the fourth quarter and Sheldon followed with a finish in traffic and then another dive to the rim plus the foul that made it a four-point game. The traveling OA fans were making a ton of noise, the bench was fired up, and the Tigers were back in a game that seemed over just a few minutes earlier. Raymond got out in transition for two and Reardon tied the game off a Sheldon assist before Flynn gave the Tigers their first lead since the second quarter with a pair of free throws. After two B-R free throws, Victoria Dacey gave the Trojans back the lead with a three, but Flynn answered right back with a three to tie it and Raymond got open on another inbounds pass for a layup with a little more than two minutes to play, putting OA in front. On the next B-R possession, the Trojans got into the lane forcing OA to help off the three-point line, which left Matulonis alone for a big shot to regain the lead. Kylee Piche would add four straight points to make it a five-point edge and the Trojans hit free throws to seal the win, while OA struggled to knock down shots on the other end in the final minute. NORTH EASTON, Mass. – The first half was a shootout between the top scorers on each team with New Bedford sophomore Chiron Rose and Oliver Ames senior Kayla Raymond going head-to-head, scoring 15 points apiece. But, it is hard to win a playoff game on the back of one player, even someone like Raymond, the Stonehill-bound Hockomock MVP. In the second half, the rest of the Tigers took over. 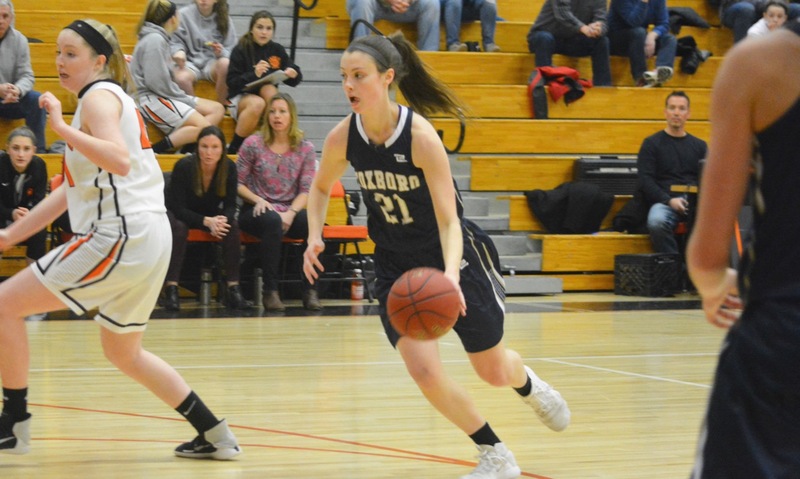 Raymond still got her points in the third (before sitting for the entire fourth quarter) but it was OA’s depth that turned a six-point lead at the half into a 69-39 victory over the 12th seeded Whalers in the Tigers’ first postseason game since moving to Div. 1. Rose came out firing and got the sizable traveling contingent from New Bedford excited from the opening whistle. She buried a pair of step-back threes and had eight points in the first to help the Whalers get off to a 8-2 start. The Tigers took a few minutes to get going but then Raymond started to take over and helped OA finish the first on a 14-2 run. She scored on a feed from sophomore Erin Holmberg then added one of her six blocks on the defensive end, which was rebounded by Katie Flynn (10 rebounds) who then fired an outlet pass to Raymond for a transition basket. She assisted on a three-point play for Alex Sheldon (19 points and 13 rebounds), drilled a three and hit a long jumper. Rose got off to a great start in the second, scoring the first seven points to put New Bedford back in front at 17-16, but Raymond answered right back with layup off a Meg Holleran assist. 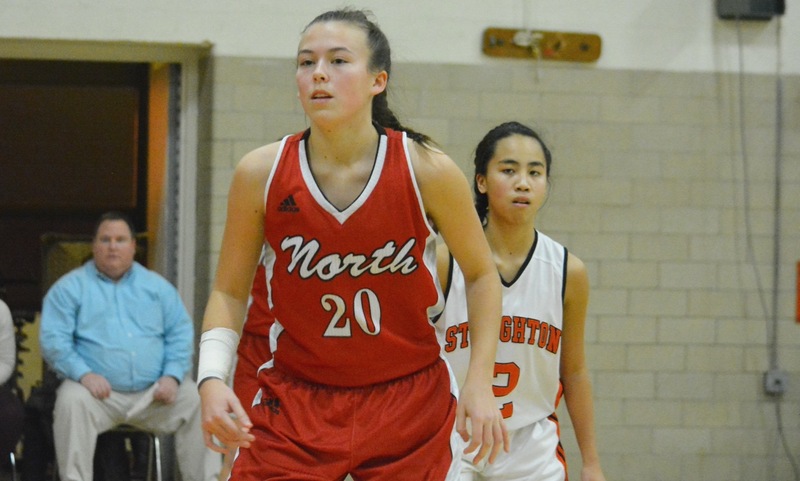 Abby Reardon (seven points) and Raymond both scored off two more of Holleran’s five assists and then Raymond added a layup around the out-stretched arms of New Bedford’s 6-foot-2 center Janice Leao (13 rebounds). A three by Kyara Almeida-Sylvia cut the OA lead to six at the break and a Rose three and a pair from beyond the arc by Monica Eires kept the Whalers in the game, down just 34-29. The Tigers would score the game’s next 13 points and in total put together a 25-2 run that finally broke the game open. Freshman Caroline Flynn got it started with a drive to the rim and she added three assists in the second half. Holmberg scored all eight of her points in the third quarter, finding leak-out opportunities for transition buckets. Sheldon was also a force in the paint, scoring 11 of her 19 points in the second half. Raymond, who finished with a line of 23 points, seven rebounds, six blocks, four assists and three steals, was still doing her thing in the third, capping the quarter by picking Rose clean at one end and swooping in for a finger roll at the other. The New Bedford guard, who was held to three points in the second half, was left with a wry smile on her face as she looked up to the rafters following the steal. OA led 51-31 after three quarters. The Tigers scored one fewer point in the third than they had in the entire first half. That continued in the fourth quarter as Tate Hadges came off the bench and scored all six of her points, Sheldon continued to control the paint and a trip to the Div. 1 South quarterfinal was confirmed. Oliver Ames (16-5) will travel to No. 4 seed Bridgewater-Raynham in the quarterfinal round on Saturday, barring a change because of the impending storm. NORTH EASTON, Mass. – Oliver Ames and Franklin had a lot on the line in Friday night’s game at the William F. Nixon Gym. The teams were tied for second place in the Kelley-Rex division and trying to stay within two games of league-leading Mansfield (which has to play both the Panthers and Tigers again this year), while OA was also trying to clinch its spot in the state tournament. Behind 29 points from senior forward Kayla Raymond and defensive adjustments strong contributions off the bench in the second half, OA rallied from three points down at the break for a 61-54 come from behind victory and a split of the season series with the Panthers. In the first half, everything offensively for the Tigers ran through Raymond. The Stonehill-commit scored 12 of OA’s 14 points in the first quarter, twice scoring on three-point plays taking the ball to the basket. She added another four in the second in the second, while Caroline Flynn knocked down a three and Abby Reardon added four. With Raymond on one side and Katie Flynn or Alex Sheldon giving weakside help, OA double-teamed Franklin center Ali Brigham, forcing the Panthers to find scoring on the perimeter. Junior guard Bea Bondhus stepped right in and drilled four threes in the first half, scoring 14 of her team-high 18 points in the process. Teagan Collins also nailed one from outside, as Franklin closed the half on an 11-4 run to lead 28-25. OA switched to man-to-man and upped the full-court pressure to try and keep the ball out of Bondhus’ hands. After Raymond tied the game with a three, Megan O’Connell (11 points) scored off a Kelsey MacCallum assist. Erin Holmberg (seven points) hit a three to give OA a lead, but Brigham (14 points and 11 rebounds) answered with a three-point play on an offensive rebound. Raymond continued to pour in the points, showing off nifty footwork under the basket to go up and under for a layup with Brigham on her back, but OA also started to get contributions off the bench. Caroline Flynn (six points) scored on a putback, while Meg Holleran and freshman Tori Harney also chipped in on both ends of the floor. OA caught Franklin in the press and Katie Flynn hit Raymond with a perfect pass over the top of the defense for a layup. It was one of five assists for Flynn, who caused problems for the Franklin defense in the high post. The senior also added four points, six steals, two blocks, and four rebounds. OA led 44-39 heading to the fourth and Raymond drained a long jumper to get the final quarter started. Franklin would not go away, cutting the lead back down to four. The Tigers stretched it back out to nine on a basket by Holmberg and a jumper by Ally Scolnick, who came off the bench to score all seven of her points in the fourth. Brigham scored plus the foul off a feed from O’Connell to keep Franklin within six, but Raymond found Flynn with a wraparound pass on the baseline for a layup. Shannon Gray answered with a three on the other end, but OA beat the press and Scolnick set up Raymond for an easy basket. Raymond then returned the favor for a Scolnick bucket in transition. 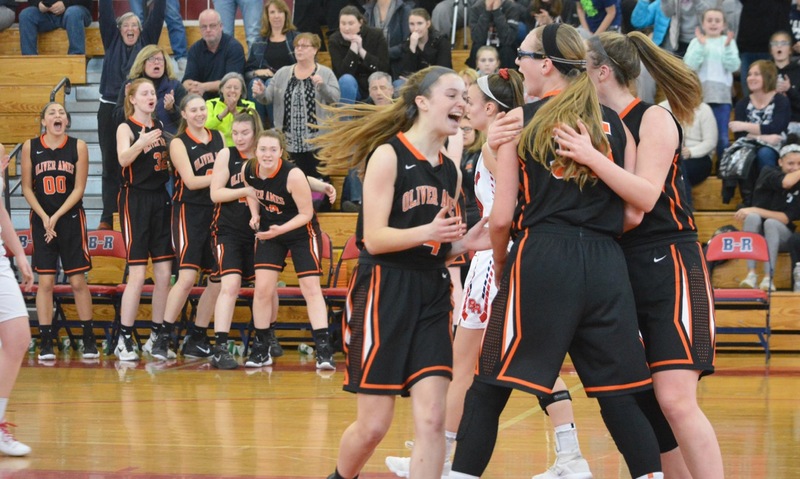 Oliver Ames (10-4, 9-3) will be back at home on Tuesday to take on King Philip. Franklin (10-6, 8-4) will try to bounce back on Tuesday when it welcomes Taunton. NORTH EASTON, Mass. – For three quarters, Oliver Ames did its best to make life difficult for Davenport division leader Foxboro in its visit to the William F. Nixon Gym on Friday night. 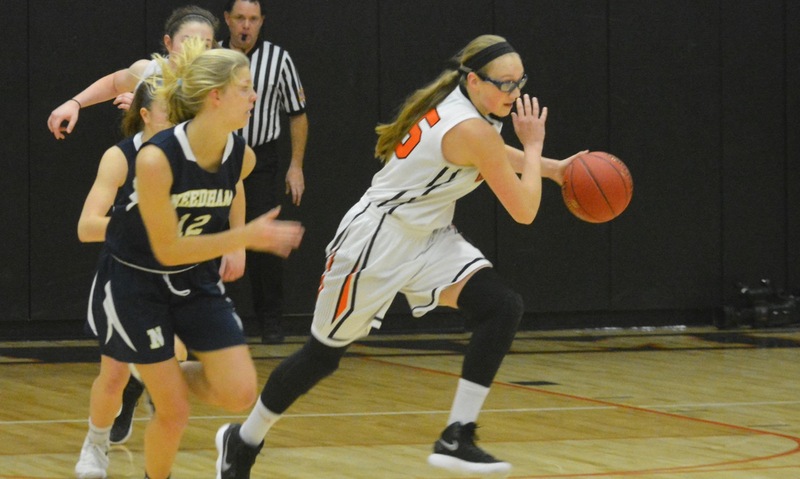 Playing without the team’s and the league’s top scorer, senior Kayla Raymond, the Tigers turned up the defensive pressure and forced the Warriors to grind out each possession. Unfortunately for the hosts, all it took was one big quarter for the Warriors to break the game open and get another league win. Foxboro closed the first half on a 10-3 run to lead by double digits, used a 21-0 run to start the second half to build a big lead, and withstood a late OA rally to win 61-39. It was the eighth time this season that Foxboro has won by at least 20 points, although few 20-point wins were as difficult as this. 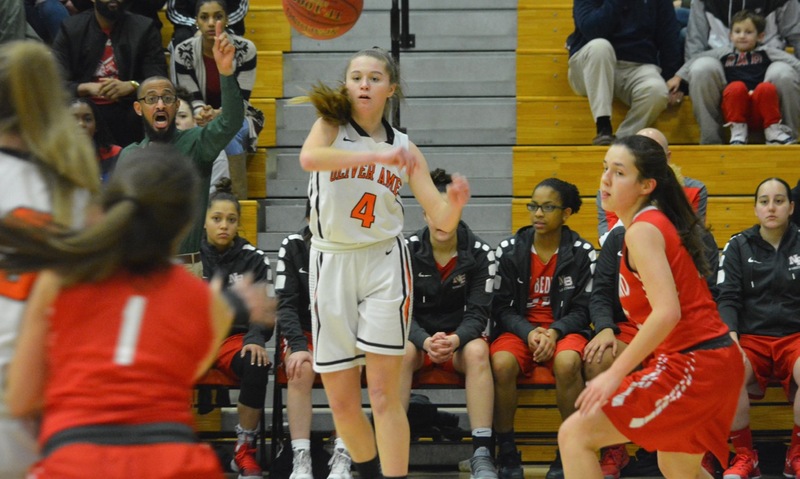 OA needed an offensive spark without Raymond and in the first quarter sophomore Erin Holmberg provided that lift with seven of her 11 points, including the Tigers’ lone made three on the night. Junior Alex Sheldon (12 rebounds) added six of her game- and career-high 20 points in the first. Even with the defensive pressure ramped up, Foxboro held an 18-13 lead after one quarter. Lily Sykes (12 points and six assists) had seven points and Grace Tamulionis (team-high 19 points) knocked down a pair of threes for six points. The second quarter was even better for the OA defense, stifling the Warriors and limiting the transition game that allows Foxboro to create so much separation, but the offense struggled. A floater on the baseline by Holmberg cut the OA lead to 19-15, but the Tigers would only get one more basket (a layup by Ally Scolnick off a Katie Flynn inbound pass) in the second. Foxboro started to push the lead with a 10-3 run to close the half. Ashley Sampson (16 points, six steals, and four assists) scored plus a foul and got to the basket on a Sykes assist to make it 29-18 at the break. The Warriors came out of the break a totally different team. Sampson scored in the half-court and instantly the full-court press started to force turnovers. Tamulionis drilled her third three of the game off an Abby Hassman assist and then Tamulionis assisted on a Sykes three. Suddenly, the floodgates were open for Foxboro. Sampson twice scored off her own steals, Tamulionis added five more points, Sykes scored in transition, and Shannon Smally (10 rebounds) scored all four of her points in what ended up being a 21-0 run (31-3 including the second quarter) and a 50-18 lead. With the game seemingly out of reach, OA started to settle down again and began a big run that would see the Tigers creep back within reach. Caroline Flynn scored off a Meg Holleran pass, Scolnick scored on the break and Sheldon added two more to make it 52-24 heading to the fourth. OA continued to grind in the fourth quarter. The Tigers held Foxboro without a point for six minutes, scored the first 15 points of the fourth (21-2 run overall), and climbed back with 13 points. Sheldon was the major force in that run, as she scored 11 points in the fourth quarter alone, twice getting on the break for three-point plays. When asked about the fourth quarter, Downs replied, “Not pretty at all.” After dropping back into a half-court defense, Downs called for the press for the final minutes and Foxboro ran off nine straight (five from Tamulionis) to seal the win. Foxboro (12-2, 10-0) will have another crossover game on Tuesday when Attleboro pays a visit. Oliver Ames (8-4, 7-3) will be on the road Tuesday to face Canton. NORTH EASTON, Mass. 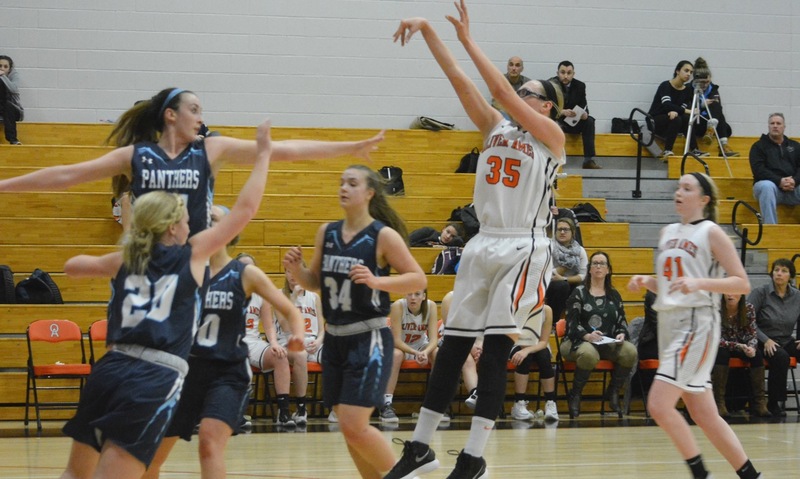 – In the three game leading into Friday night’s first-place showdown with Mansfield in the William F. Nixon Gym, Oliver Ames senior forward Kayla Raymond had averaged 32 points per game. But defense has been the cornerstone of back-to-back league titles for the Hornets and they came out intent on keeping the Stonehill-commit quiet. Using a box-and-one defense and taking advantage of a roster filled with athletic wing defenders, Mansfield held Raymond to just six points on the night and the Tigers to only seven points as a whole in the first half to win 44-31 in the first of two meetings between the teams this season. The game plan worked to perfection in the first half. Mansfield held OA scoreless for the opening five minutes of the game, allowed only one made field goal in the first quarter and three made shots in the first half to build a 24-7 lead at the break. 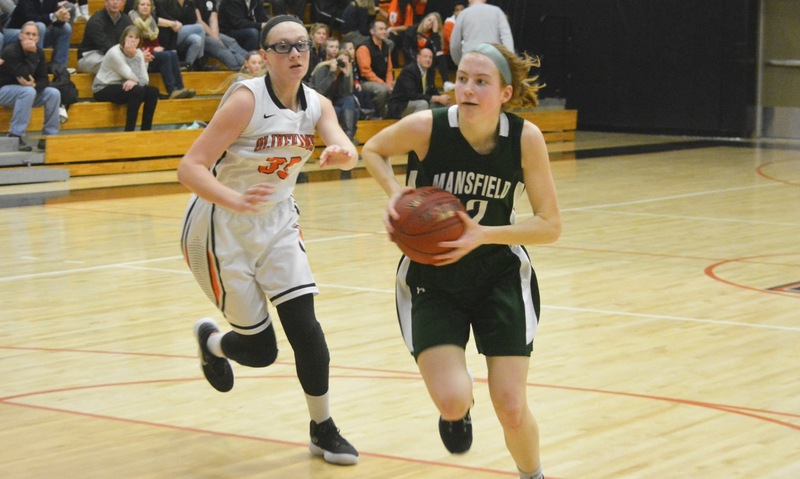 Mansfield also got off to a strong start offensively with Ann Maher scoring all eight of her points in the first, including a pair from beyond the arc, and Meg Hill getting five of her game-high 16 points. Hill, who will team up with Raymond at Stonehill next year, also added nine rebounds and five blocks, just missing out on another double-double. In the second quarter, Meg Holleran came off the bench and scored four points for the Tigers, one layup off a Raymond assist that momentarily looked like it might get the hosts going and a second after Katie Flynn pulled down and defensive board and sprung Holleran on the break. Those were the only baskets of the quarter for OA, while Mansfield continued to get the ball into the paint with Hill scoring off assists by Maher and Kemp and Danehy (10 points and nine rebounds) scoring five in the quarter. Hill capped the half by knocking down a long jumper to make it 24-7. The second half was much better from the Tigers, although OA only managed two made shots in the third quarter as well. Alex Sheldon scored all five of her points in the third and Raymond got on the board, going 3-of-4 from the line. Holleran (10 points) also knocked down one of her two second half threes but Mansfield matched the Tigers in the quarter. The Hornets were sparked off the bench by Mulkern (10 points), who knocked down a three after Mady Bendanillo swung the ball around the perimeter and added four more points in the fourth as well. OA was not able to close the gap in the third, despite having moments when it seemed as though the momentum may have swung to the Tigers. Erin Holmberg scored five of her seven points in the fourth, including a three on the game’s final shot, and Holleran knocked down her second three of the night. Raymond finally got a clean look and hit a three for her only made field goal in the game. Hill scored twice in the fourth, both on assists from freshman Ashley Santos, to keep the Hornets ahead by a comfortable margin, as OA never got closer than 13 in the second half. Mansfield (9-4, 7-1) will travel to Sharon on Tuesday, while Oliver Ames (7-3, 6-2) faces a trip to Milford.